Power spectrum of global sun velocity oscillations derived from 800 days of measurements by GOLF. 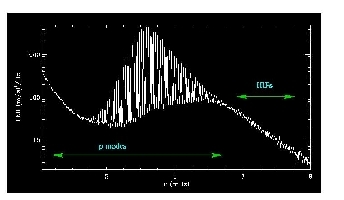 The spectrum is dominated by the p-mode band up to the cut-off frequency (~5.3 mHz). Above this frequency a mode-like structure appears, corresponding to the so-called High Interference Peaks [HIPs], which are due to partial wave reflection in the solar atmosphere.